Agent 1: Isn't it fine weather for flying a kite? Agent 1: I *said*, Isn't it fine weather for flying a kite? Agent 2: Oh, sorry, I didn't hear you, I was too busy BEING AWESOME. Agent 2: Isn't it fine weather for BEING AWESOME? Especially in a hat. You would be more awesome in a hat. Agent 1: [in a quiet voice] I need the counter-sign. Doofus. Especially when you are awesome. In an awesome hat. Agent 1: The pickup is at 0800 in the main train station. Agent 2: "Main train" rhymes! Agent 1: I'm getting too old for this. Ah, Givenchy! Swoon!I think the one on the right is trying to channel Audrey Hepburn, thus upping her secret agent status (in an appropriate dress, no less). Love the pattern and the post! Too funny! I wonder what secret documents she is hiding in that document shaped purse? Of course, Agent 2 is well-equipped with gloves that guarantee she will avoid leaving not only fingerprints but also elbow-prints. i love the huge collar and wide belt. sassy! Proportions are perfect and that belt-ooh la la! Love the long gloves, too. LOL! love the post AND your blog! Yea verily, I am CRUSHED that this pattern is not available and not available in my size.I am going to a Third Man Appreciation Convention and need an appropriate pattern from Givenchys Post War/Cold War Espionage Collection.Okay, I am not, but if I had this dress, I would HOST that convention. I just want the BELT! Love the big wide belts! Like your style ideas…good that we can discuss such things. Love this post! I am lucky enough to own this pattern. Its always been a favorite. I adore your agents. So like a cross between Graham Greene and Audrey Hepburn. 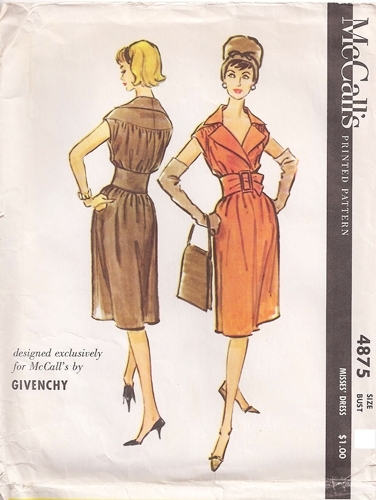 More pattern stories please (Ive read through the archives of them and have been much amused).